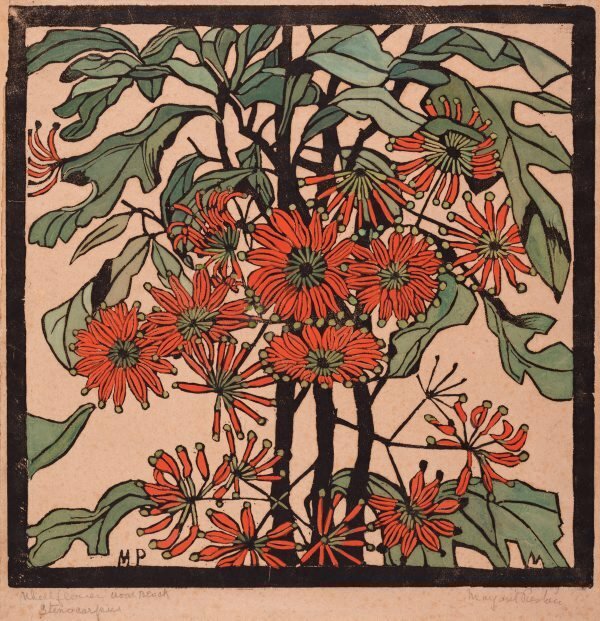 One of Margaret Preston's most exuberant prints, 'Wheel flower' represents the flower from the firewheel tree, Stenocarpus sinuatus, a native found in the coastal rainforests of Queensland and northern New South Wales. In her flower prints of the mid 1920s, Preston took both Australian and European plants as her subjects, transforming them into striking decorative images with brilliant colours and strong black outlines. They tend to be composed with a tight central focus and drawn with a minimum of detail in a flat, graphic style. In one vein of her work from around 1927, she restricted her palette to black and white with sombre greens, blues and browns, and further flattened her drawing to produce paintings and prints that are crisply austere and rigorous in their marriage of form and content. In prints such as 'WA banksia' and 'Flannel flowers', both c1929, the natural form of the plants is compressed into the vase at the centre of the composition, underlying its strict geometry. In contrast 'Wheel flower' appears riotous and undisciplined, as if the firewheel flowers have escaped the confines of being arranged – and indeed one of the many distinctive aspects of this print among Preston's botanical work is that the flowers are not in a vase. The firewheel tree appears to grow out of the bottom of the page and continues beyond the top; the leaves and flowers cascade across the surface, giving the work an extraordinary dynamism. Clearly 'Wheel flower' is carefully crafted and arranged, yet its sense of movement sets it apart from Preston's other flower prints, where the botanical components are layered in such a way as to emphasise flatness and stasis. Here, the hand-coloured two- and three-toned leaves tumble and fall across the surface, and although the depth within the print is characteristically shallow, a greater illusion of naturalism is conveyed by the sheer animation of the forms. The firewheel flowers are depicted in various stages of life and decay, a convention that is common to botanical illustration but is represented in 'Wheel flower' as if randomly: in the centre the flower-clusters are luscious and whole, but as they cartwheel out to the edges of the composition individual flowers fall away and the clusters thin out, with a sole spindly black silhouette representing the dead flower cluster – a botanical memento mori. The colour in 'Wheel flower' is hot and tropical, a shift away from the monochrome severity of some of Preston's contemporary prints and paintings. In her use of the orange-brown paper as a backdrop for the brilliant red of the flowers and the lively greens of the leaves, she exploited the sensuality of the plant, giving it an intensity that, precisely because of the shallow space, conveys the claustrophobic, fecund aura of the rainforest. 'Wheel flower' is a bravura work. Its rich harmonies and contrasts, its dynamism and its impeccably composed chaos convey brilliantly, within a consciously decorative style, a sense, above all, of the life force of the plant.